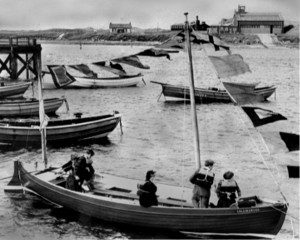 The Coquet Shorebase Trust was founded in 1992, but the history of the Shorebase goes back to the 1950’s. The Headmaster of South Broomhill Secondary Modern School saw the need for training in Navigation and Seamanship, particularly for the many boys who went on to work in the local fishing fleet. A two –masted whaler, the ‘Collingwood’, was built at Harrison’s Boatyard, and launched in 1951 (with a bottle of Tizer) to enable nautical studies to be introduced to the curriculum. In the following years this became an official Merchant Navy training course, lasting 2 years and open to pupils from all over the county – many boarding in Amble during the week. They went on to work in the local fishing fleet, the Merchant or Royal Navy, and crew the Amble Lifeboat. A training base – the original Shorebase – was built on the landward end of what is now Coble Quay, and a larger seagoing boat, the Seaquest, was commisioned to increase the scope of the training given. The Seaquest now sits on the harbour wall, upside down, in two halves and part of a quick food outlet! The 60’s and 70’s saw an increased interest in outdoor activities, and a number of schools built their own sailing dinghies, which were kept at the Shorebase and used to teach sailing to children from all over the county. Adults were also keen to learn to sail, leading to the formation of the Coquet Sailing Club in 1982. By 1987 the Merchant Navy Training Board had long gone, and although Nautical studies was still a popular subject at GCSE, it was just another subject, not a special 2 year training course. When the post of Head of Nautical Studies became vacant, the decision was made to split the post 50/50 between curriculum work and Youth Service/ Further Education activities. Vic Brown was appointed to this post and over the next 5 years the Shorebase expanded its activities. A wider range of school courses introduced pupils to watersports, many more local schools were introduced to sailing and kayaking, the Coquet Canoe Club was established, and disability groups were catered for. Adult training courses were provided for the unemployed, leading to instructing qualifications and job opportunities. During the early 1990s it was estimated that 75% of year 11 pupils at Coquet High School had been canoeing or sailing with the Shorebase. 1992 saw big changes as funding was moved from the NCC Education Committee (which had been funding the Shorebase as County wide facility) to the schools. It also became apparent that while the Coquet High School would like to fund the Shorebase, it could not afford to. Therefore, along with most Outdoor Education Centres in the County, the Shorebase was threatened with closure. A big campaign to keep it open was mounted by both the Clubs, Amble Town Council, parents of local children and the schools who used the base. A petition with 2,000 signatures was presented to the Education Committee, and as a result they made the campaigners an offer. 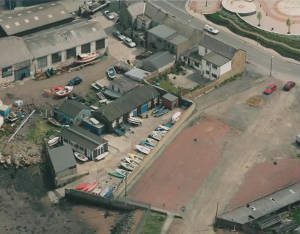 The Town Council and the two Clubs worked together to form the Coquet Shorebase Trust, and the NCC granted them a lease of the Shorebase premises on a peppercorn rent, together with all the boats and equipment. Charitable status was successfully applied for, and grant applications submitted to fund activities and purchase better equipment. Vic Brown continued to work as Manager of the Shorebase, but in a self-employed capacity, with strong support from the Committee and Club members. During the first six years the trust raised funds to build up the fleet of boats, made improvements to the premises and buildings, and expanded activities to many groups and schools, particularly focussing on disability groups. By 1998 the financial position was good, income was sound, and the committee was confident we could appoint a full time manager. Claire Knifton joined us on a 3 – year contract at this point, and when she moved on, Paul Hewitt took over on a permanent contract. Paul’s main sport was Windsurfing, and he applied for grants to buy a windsurfing fleet and set up the Coquet Windsurfing Club which operated from Druridge Bay Country Park. Our use of the Park increased with the purchase of a container to store equipment and the use of Portakabin for changing. A successful funding bid to Sport England and the Single Regeneration Budget (EU fund) enabled the trust to appoint Simon Tibbitts on a 5 year contract as Watersports Development officer. A part-time secretary joined the team and Geoff Barrett was employed over the summer months as an instructor. When Paul and Simon moved on to other jobs, Phil Scowcroft came as the next manager. For many years we had wanted to improve our facilities at the lake, and he worked with NCC on a grant application to a major funding opportunity, which unfortunately was not successful. When Phil left to work for the BCU, Vic Brown took over as Manager on a voluntary basis in 2010, and looked at other ways of funding improvements at the park. This coincided with funding being released to celebrate the London Olympics, and successful applications to this fund and others gave us a permanent facility at the lake by the Visitor Centre which opened in 2014. By then we were also involved in a Coastal Community Fund project to develop the seafront in Amble and which included relocating the Shorebase to a new site upstream of the Coquet Yacht Club and Amble Boat Club. We moved to the new premises in April 2015. The greatly enhanced facilities at both our premises have opened up new avenues for participation, both in Amble and at Druridge Bay Country Park. click or tap here to go back to the home page.